Join the Segway Sensation SA Team and experience all the delights of gliding among the grapevines, at the iconic Seppeltsfield Winery. Participants must weigh between 40kg and 120kg. Minimum age requirement : 12 years of age. 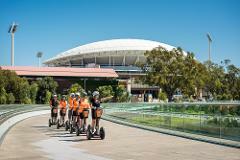 See the iconic sights of Adelaide’s Riverbank precinct on a Segway! Participants must weigh between 40kg and 120kg. Minimum age requirement : 12 years of age. The Perfect Gift! A 60 min Segway tour of either the fabulous, attraction filled Adelaide Riverbank or the beautifully scenic Seppeltsfield Winery. Participants must weigh between 40kg and 120kg. Minimum age requirement : 12 years of age. 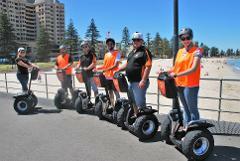 Join the Segway Sensation SA Team and experience all the iconic sights of Glenelg Foreshore precinct. Participants must weigh between 40kg and 120kg. Minimum age requirement : 12 years of age. Enjoy a day tour with experienced tour guides thru iconic Adelaide city locations starting at the Central Market for a food experience picnic lunch and then followed up with an extended Segway Tour package including coffee and a cookie.